People like to make assumption rather than fact finding when exercising their right of freedom of speech nowadays. Nothing's wrong with that. The issue is that when we offer opinion without really knowing, (or in the case of Rumah Terbalik in Tamparuli), and having no personal experience about the subject we are commenting. And because of that, people develop negative perception towards the subject matter. 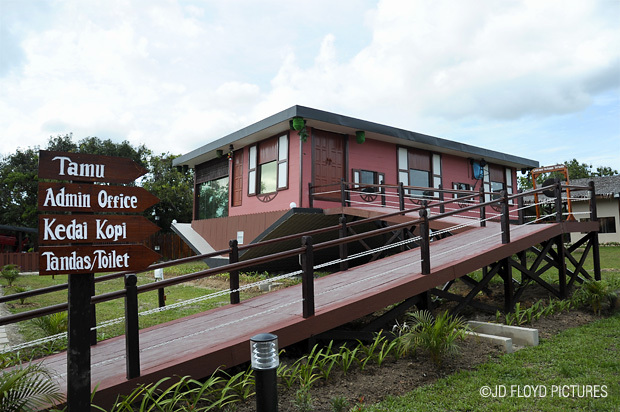 My wife and I had an early breakfast this morning and while reading the Daily Express I saw another article about the Upside-down House of Borneo in Tamparuli. This time the owner and the architect came out addressing the concerns of the public - or rather few individuals - pertaining to health and safety of patrons. For the record, few days ago PAM Sabah past chairman questioned the qualification of the architect involved in designing the house. Reporters on the other side question the so-called dizziness one would feel after being in the house for 10 minutes. Read today's copy of the local papers yourself. While having no vested interest whatsoever in the property and getting no monetary gain writing this, I would say those allegations are a complete NONSENSE! Go there and feel it yourself and tick me if you feel dizzy. If anything, the lack of air-conditioning is the reason you'll feel stuffy after 5 minutes. Temperature inside the house heats up during sunny days and that stresses the body a bit. I felt nothing unusual and the hanging upside-down stuffs don't confuse my vestibular system into coaxing me to lose my balance. You are allowed to walk only on the dedicated carpet walkway to avoid bodily injury caused by impact from objects that might fall off. If that is your concern then your safety risk is higher back home where fluorescent lamps, ceiling fan, air-conditioners, or your lantern decors are hanging. Paul Yap is the engineer who made sure of the integrity of the structure and he is a well-known local consultant. What's the fuss about? This house is as good as, if not better than the houses built within the area, except that it is artificially made to look upside down. Remove the roof-like fittings below the floor level and it looks no different from any house. To the owner, Mr. Yee as the paper quoted him as, this is a great place to 'pit-stop' before continuing with a long journey to, say, Mt.Kinabalu, Kundasang, Ranau or Sandakan/Tawau in the East Coast. Since this is just part of the Tuaran Craft Centre as mentioned, it would be a good idea if you fill the 'tamu' with more handicraft sourced from the folks. The bakery offers great foods but they come only in small quantity. The trays ran out stock of my favorite tuna and chicken curry puff. It was a weekend, so it could be due to that. Environmentally friendly building versus dizziness? Not in my dictionary. I am a strong advocate for the preservation of the nature but feeling dizzy when entering certain house cannot be in the same equation with environmental friendliness. If you fancy getting dizzy, try driving further towards Tamparuli town and taste the famous Jambatan Gantung Tamparuli. 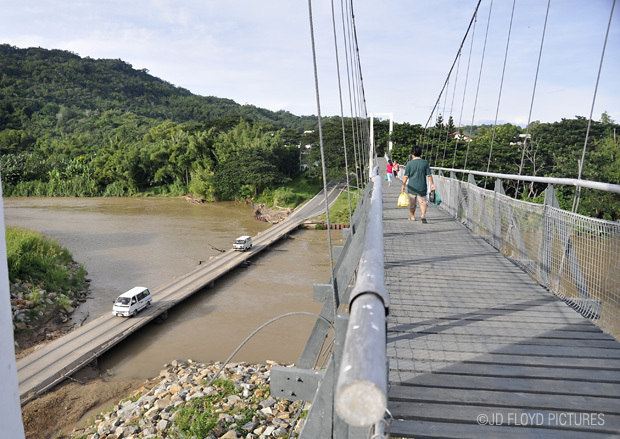 It is a suspension bridge built with sturdier material compared to the old one but chances are many would feel uncomfortable walking on it simply due to the height and the structural sway. Good luck, and happy travelling. suatu tempat yang harus dilawati dan menjadi topik perbualan dlm 2 minggu ini. Wow, I can't believe the upside-down house really exist!